We’d love your help. 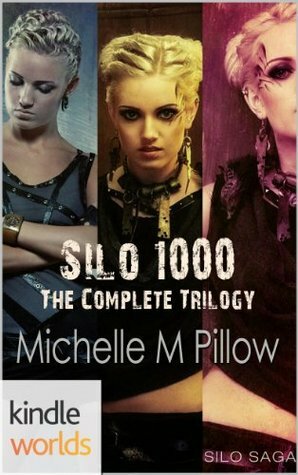 Let us know what’s wrong with this preview of Silo 1000 by Michelle M. Pillow. Trapped in an underground silo because the air outside is too toxic to breathe, the people of Silo 1000 are very aware they're only one of many such self-contained units. Human survival is top priority as they wait for the day they can once again walk the earth. In such a reality, Maryann Holston never bothered trying to fall in love. She knows she'll have to take whatever fate the silo thinks is best for the betterment of all. But as she runs into childhood friend, Paul Allison, she realizes that maybe love is exactly what her life needs. No longer the lanky boy from her youth, Paul is everything a woman could want and she intends to be his wife...until the unthinkable happens. There are those who will stop at nothing to make sure Maryann is out of the picture--permanently--and Paul's ready to prove he's willing to do anything to save the woman he loves. To ask other readers questions about Silo 1000, please sign up. The complete series parts one through three. The future of earth is living below ground in large silo living areas. Each silo contains no more than 1000 people and the rules are strictly guarded to maintain their society. They have very limited contact with other silos. Maryanne has never considered love for herself, knowing her spouse will be chosen for her. That is until she runs into childhood friend Paul. He changes her mind and makes her believe they can have a future and be happy together. The complete series parts one through three. The future of earth is living below ground in large silo living areas. Each silo contains no more than 1000 people and the rules are strictly guarded to maintain their society. They have very limited contact with other silos. Maryanne has never considered love for herself, knowing her spouse will be chosen for her. That is until she runs into childhood friend Paul. He changes her mind and makes her believe they can have a future and be happy together. He has a prestigious position and should have no problems. They don't count on spoiled Mayor's daughter Missy deciding she wants Paul for his prestige. With the help of someone unexpected, Paul and Maryanne are separated. Will love be strong enough to find a way? They fight for this one freedom. Enjoy this look into a post-apocalyptic earth and the remaining people. Ms. Pillow takes the world created for fan fiction and adds her special touch. Maryann has become used to her life in the Silo born here many years after earth became uninhabitable. She has a better life than some but knows marriage will be pressed on her and she has no one of interest. Until she runs into a childhood friend who has wanted more than friendship. Will Paul convince her of a future with him? With unknown enemies to their union working against them, will they find happiness together? A last minute surprise interrupts. Is it a good surprise? Read on the find out how these two engaging characters deal with their restrictive lives. Part two finds Maryanne parted from Paul, in another silo. They are unaware of the machinations that pulled them apart. She finds life and rules very different, even more restrictive. A strong woman she puts herself in danger by speaking up. Paul still wants her and fights to find a way. Maryann gives him some news that spurs him on. Will he find a way or will her independence bring her existence to an end? Maryanne knows there are problems on Silo 998, but to say so puts her in danger. Paul is still trying to find a way for them to be together but Maryann is losing hope. Will she face the danger and stand up to the powers that be? Will Paul find a way? And what of their enemies? Are they still being plotting against? So if you are a regular to my blog you may have noticed that I worship Hugh Howey and all things silo related, I was offered a chance by the lovely people at Kindle Worlds to review some books and as soon as I saw this one my fingers couldn't move fast enough to the download button. Now before I review let me tell you about Kindle Worlds, it is a publishing platform run by Amazon where you can choose a licensed world, in this case Hugh Howey's Wool, and you can upload your own story to it, so you have in all intents and purposes excellent fan fiction on worlds such as The Vampire Diaries and Gossip Girl, the one bug bear, why is it not available to the UK? This amazing book is not available for us to download in the UK, hopefully Amazon will make this platform available to us soon! Right, lets look at the book, Michelle M Pillow has taken the Wooliverse and expanded upon it in a truly amazing way, There are two main characters in this story the first is Maryann Holston a young nurse in silo 1000, she has discovered a secret that is hidden behind the walls of this enormous structure and whilst making her way to this secret she is discovered by Paul Allison, Head Medicinal Pharmacist who had aged for the better since she last saw him. When Paul discovers Maryann, he is not alone, he is with Missy the daughter of the mayor and because of Paul's important job along with the fact he is about to move in to better accommodation she wants them to marry, he doesn't, he has been in love with Maryann for years and when Missy leaves he extracts Maryann from the walls he tells her how he feels and they quickly decide that maybe they should marry each other the alternative for Paul is Missy and he wants to avoid that at all costs, a passionate kiss seals any doubt of their mutual attraction so they start making arrangements for the marriage ceremony. Up top Samuel Daphne watches the screens, the landscape never changing, the same rocks of the sheriff and his wife from Wool still a landmark on the screen (if you are paying attention you may realise silo 1000 is silo 18!) but and this was the bit I really loved some of the bodies are still walking about, they have stopped cleaning now so whenever someone is sent outside they go without the "protective" suit, I think it is an inspired idea to have these bodies wandering around!! One of these bodies is that of Helena, Samuel's wife, every night he comes to the screens to watch her slowly make her way past, he is slowly losing his mind, he does not see his wife as a decomposing corpse he still sees her as the beautiful woman she was. He is interupted one night by Missy ranting over the fact that Paul will not marry her and is going to be marrying Maryann, as Missy carries on his wifes name - Missy Helena - he sees this as a sign he has to help her stop the wedding so she can get her own selfish way. What happens next is Maryann finds herself sent to the hellhole that is Silo 998, a silo where men are men and women do what they are told, nurses have been killed there by increasingly aggressive patients, Maryann fears something is wrong with the people in this silo but as a woman she has no say in the matter until she takes mattters in to her own hands, she misses Paul and she will do anything to get back to him. Silo 1000 shines a brand new light on the amazing Wooliverse, I never tire of hearing stories of the silos, there is so many of them, the possibilities are endless! Michelle has done a great job creating likeable characters along with ones that are just plain mad! It gets the world bang on and you can feel the tense atmosphere in the silos straight from the pages. My one downside (apart from the whole Kindle Worlds thing) its really novella sized I could have happily read a lot more of it!! Michelle M Pillow is a truly gifted author and I am a huge fan of her Dragon Lords series so when I spotted this I was beyond interested to read it. It's fan fiction I guess or a salute if you wish to call it that to the work of Hugh Howey and his Wool trilogy. If you have read that intruiging and incredibly intense series of books you will find this book a little different but nevertheless a satisfying glimpse into a dystopian and bleak future where humanity survives in a post apocalyptic lands Michelle M Pillow is a truly gifted author and I am a huge fan of her Dragon Lords series so when I spotted this I was beyond interested to read it. It's fan fiction I guess or a salute if you wish to call it that to the work of Hugh Howey and his Wool trilogy. If you have read that intruiging and incredibly intense series of books you will find this book a little different but nevertheless a satisfying glimpse into a dystopian and bleak future where humanity survives in a post apocalyptic landscape by living deep underground in silos. Ms Pillow is primarily a romance author and a steamy one at that but here she clearly just enjoys telling a story and it's a cracking one at that! This is in three parts and tells the story of Maryann a young nurse living in silo 1000 where only 1000 people are allowed at any one time. Someone has to leave or die an order for anyone else to be born or allowed in. It's a harsh way of living and indeed could be considered hell on earth but it's what those who live there are used to and so no one questions their way of life. Paul is a medical pharmacist and as such is highly valued but when he reconnects with Maryann the girl he played with as a child he realises he is in the position of finally making her his wife. Unfortunately Paul is desired by the mayors daughter Missy and a fiendish plot tears Maryann and Paul apart. Maryann is forced to go to silo 998 where there's a dangerous epidemic but will the two ever be together again? Michelle Pillow has written a really great piece of fan fiction based upon the Silo Saga: Wool worlds created by Hugh Howey. (This review does not have any direct spoilers, but may take a bit away from the unfolding story. I tried very hard to not do any spoilers!) It is a 3 part serial that follows Maryann & Paul as they are trying to overcome the ways of their people and their very existence to be able to follow their hearts and get married. The ways of life in the A very intriguing read! Michelle Pillow has written a really great piece of fan fiction based upon the Silo Saga: Wool worlds created by Hugh Howey. (This review does not have any direct spoilers, but may take a bit away from the unfolding story. I tried very hard to not do any spoilers!) It is a 3 part serial that follows Maryann & Paul as they are trying to overcome the ways of their people and their very existence to be able to follow their hearts and get married. The ways of life in the Silo is a predetermined plan for every person basically. Everything that is done is done for the purpose of the people as a whole. In order to get married it is usually to the best match, not for love. In order to be eligible to have a baby, someone else will have had to die. Silo 1000 is exactly that. Only 1000 people can live there. I found this to be a quite interesting read and different from what I would normally choose. But since Michelle had written it, I wanted to read it! I am glad that I did! I have now bought Hugh Howey’s Wool collection and will be reading those too! A great read that I will read over & over again through the years (especially after I have read Hugh’s books!). Abit different to what i normally read and didn't know michelle wrote one like this so it was intriguing to see how this turned out, i was interesting see how they lived there lives and how things were run. This was a great set and I enjoyed the continuing story of the people in the silo's. I only wish each individual story had been longer since they were such a quick read and still able to draw me into the world easily. I look forward to many more stories from this author in the future. Michelle loves to travel and try new things, whether it's a paranormal investigation of an old Vaudeville Theatre or climbing Mayan temples in Belize. She's addicted to movies and used to drive her mother crazy while quoting random scenes with her brother. Though it has yet to happen, her dream is to be a zombie in a horror movie. For the most part she can be found writing in her office with a cup of coffee while wearing pajama pants. Michelle M. Pillow is a multi-published, National Bestselling Author writing in many fiction genres including the Bestselling Dragon-Shifter series Dragon Lords and Captured by a Dragon-Shifter, and the mischievously magical Warlocks MacGregor. Works also include Lord of the Abyss and Lords of the Var and the National RT award-winning historical Maiden and the Monster. She loves to hear from readers. They can contact her through her website.